Park Paradise Just Minutes Away! 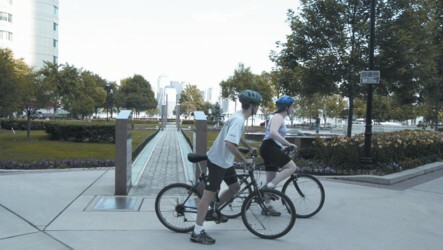 It’s now easier than ever to walk, roll or ride from Newport to one of the area’s great attractions – Liberty State Park. You can drive or ride the Light Rail, too, but the most scenic route is along the waterfront. Following the route on a recent Sunday, there was much to see and do. Leaving from Newport’s LeFrak Lighthouse, follow the HRWW along bustling Pavonia Ave. The walkway here is on the street side around Newport Financial Center, which predates the rest of Newport. It was originally an eight story warehouse built early last century to serve nearby freight yards. Follow the brass pavement markers south through Marina Park and around Newport Office Center VII. Watch out for Canada geese in this spot, as they love grassy lawns! The path continues past Avalon Cove on a wooden boardwalk and then east to the end of the pier. Following the path southward, you pass another new office building. The plaza here had lots of seating for watching river traffic, including some unusual granite chairs from Barcelona. After curving by the Harborside ferry terminal, I saw the old Hudson & Manhattan Railroad Powerhouse a block away. This 1908 landmark once powered the entire PATH system. Today it is still owned by the Port Authority, and awaiting adaptive reuse. Behind the Powerhouse you can see the blocks of old warehouses from Jersey City’s days as the nation’s premier rail shipping hub. A wooden boardwalk leads past Harborside Financial Center, another old freight warehouse from the 1920s now updated and converted to offices. The complex now is flanked by newly reconstructed piers of apartments and a hotel, with public plazas at the river ends. Continuing south, enter the heart of Exchange Place. This was formerly the site of the largest passenger train shed in the world, when the Pennsylvania Railroad ran down Columbus Drive to a waterfront terminal. It was closed a few decades after Penn Station in New York opened. The connecting PATH station still remains, but aboveground new office buildings have filled in the old rail yards. The only original building from a century ago is 15 Exchange Place, once New Jersey’s tallest “skyscraper”. I paused at the September 11th monument just past Exchange Place — which incorporates a steel girder from the twin towers and an image of the former view across the river. Farther down, stop to see the sleek new Colgate ferry and helicopter terminal. The walkway ends – for the moment – at the brand-new Goldman Sachs building. Designed by architect Cesar Pelli, it is 781-ft tall – the tallest in New Jersey, and about the same height as the tallest buildings in Lower Manhattan. Look next to the lobby for the famous Colgate Clock, the 50-foot diameter timepiece that stood on top of the Colgate-Palmolive warehouses on this site from 1924-1985. Making a right turn, follow the light rail line on Essex Street and then turn left on Washington to enter the Paulus Hook historic neighborhood. New buildings blend with old converted warehouses, like the Sugar House in this area, one of the oldest parts of Jersey City. 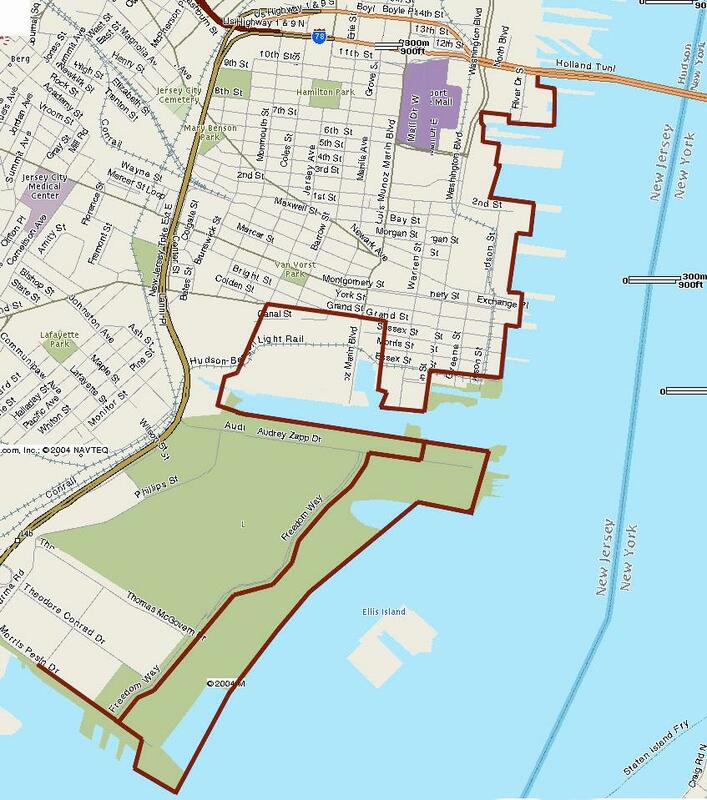 Note the small grassy section of Liberty State Park on the peninsula – a preview of what is to come. The walkway restarts here for a short length along new apartments beside the Morris Canal and then turns back north before ending at Essex Street again. Continue north on Van Vorst St., then turn left at Grand Street at the renowned St. Peter’s Prep School. 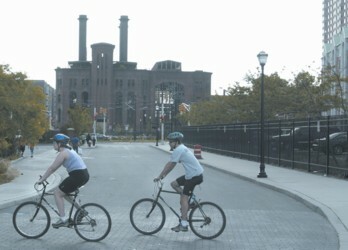 Traffic on Grand Street is fairly quiet on weekends and evenings, making bicycling easy. After riding four blocks, turn left onto Jersey Ave. The new Jersey City Medical Center is on this corner, and the area is quickly developing. Jersey Ave. ends at a recycling yard – the same company that brought recycling back to New York City – but there is a wide dirt pathway that continues over a small bridge heading south. 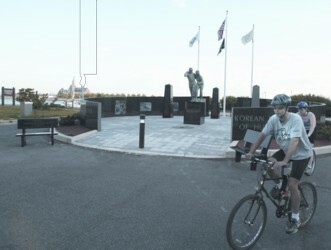 Make a left at the gap in the fence and you are through the back door of Liberty State Park. Turning towards the water again, follow the path alongside the enormous Liberty Landing Marina. 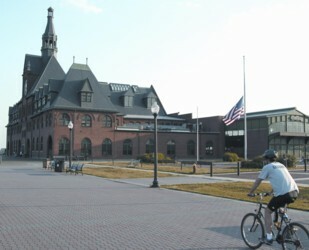 After about a mile, you reach the Hudson River again at the restored Central Railroad of New Jersey Terminal, now an information and exhibition center. From 1889 through 1967 this was one of the main transit points for immigrants arriving at nearby Ellis Island, and a major commuter hub for New York City – a peak of 21 million people passed through in 1929. (This is about the same number that pass through LaGuardia Airport today.) The ruined train platforms have been preserved and the main hall has been beautifully restored. Note the stairs that used to lead to the double-deck ferry docks. From the Terminal the options are endless – Liberty State Park has massive open fields, quiet walkways, picnic areas, tennis courts, concert grounds, a nature center and a playground whose sheer size is magical for adults and children along the waterfront promenade, a distance of 1.6 miles farther south. 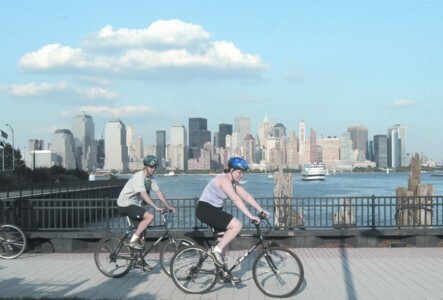 Double back on the bike path alongside Freedom Way to the original entry point into the Park and start the two mile trip back to Newport—or you can keep going and visit Liberty Science Center! Living in Newport certainly is convenient for day trips to New York and the rest of the metro region, but for your next sunny day outing, try travelling south through Jersey City. You will be glad you did.